Nick Gordon does not have any MLB stats for the season. Draft: 2014, Minnesota Twins, 1st rd. Nicholas Chad Gordon...Twitter: @FlashGThe3rd...son, Jaxon (born in 2018)...2014 graduate of Olympia (FL) High School...hit .517 with 10 doubles, two triples, six home runs, 27 RBI and 13 stolen bases as a senior, and .505 with 15 doubles, six triples and 12 stolen bases as a junior...named Gatorade Florida Baseball Player of the Year in 2013 and '14 and named a Perfect Game All-American...rated as fifth best prospect in the 2014 draft by MLB.com...ranked as the sixth best prospect, and as having the best infield arm, in the 2014 draft by Baseball America...verbally committed to Florida State, but elected to play professional baseball...is the son of three-time All-Star right-handed pitcher Tom "Flash" Gordon and brother of current Mariners infielder/outfielder Dee Gordon...produces hip hop music in spare time, rapping under the alias G-Cinco (gcincomusic.com). Was an invite to Twins spring training, the second of his career; reassigned to minor league camp March 18...Began season with Double-A Chattanooga and recorded a four-hit game in first game April 5 vs. Birmingham...Named Twins minor league player of the week May 12, hitting .385 (10-for-26) with three doubles, one home run and five RBI in seven games for the Lookouts...Promoted to Triple-A Rochester May 22 where he finished the season...Between both stops, played 103 games (102 starts) at shortstop and 36 games (35 starts) at second base...Combined to hit .248 (135-for-544) with 23 doubles, seven triples, seven home runs, 49 RBI, 62 runs scored, 20 stolen bases and a .298 on-base percentage in 141 games between Chattanooga and Rochester...Led all of minor league baseball in games played (141), playing 99 with the Red Wings and 42 with the Lookouts...ranked third in at-bats (544)...Added to Twins 40-man roster November 20. Was invite to first career Twins spring training, reassigned to minor league camp May 18; spent entire season with Double-A Chattanooga... Named MiLB.com Southern League Player of the Month for May, hitting .294 (32-for-109) with 11 doubles, three triples, three home runs, 15 RBI and 14 walks in 27 games...Named Southern League Midseason All-Star...Named SiriusXM Futures Game All-Star, leading off and playing shortstop for the US Team, going 1-for-3 with a run scored...Set season-high and tied minor league career-high with five hits August 14 at Birmingham...Named Southern League Postseason All-Star...Hit .299 (119-for-398) vs. right-handed pitching and .174 (21-for-121) vs. left-handed pitching...Ranked tied for second in all of Double-A baseball in triples (8) and fourth in at-bats (519)...Ranked tied for first in Southern League in triples (8), third in hits (140) and runs (80), fourth in total bases (212), and tied for sixth in doubles (29)...Ranked eighth best prospect in Twins system by Baseball America, entering 2018...ranked 80th best prospect in baseball by MLB.com. Inbox: Which prospects will make MLB debuts? 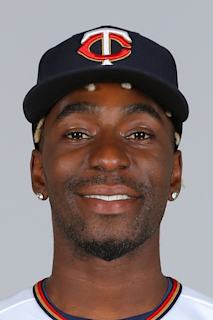 April 1, 2019 Rochester Red Wings placed SS Nick Gordon on the 7-day injured list. March 12, 2019 Minnesota Twins optioned SS Nick Gordon to Rochester Red Wings. November 19, 2018 Minnesota Twins selected the contract of SS Nick Gordon from Rochester Red Wings. May 22, 2018 SS Nick Gordon assigned to Rochester Red Wings from Chattanooga Lookouts. February 6, 2018 Minnesota Twins invited non-roster SS Nick Gordon to spring training. July 10, 2017 Chattanooga Lookouts activated SS Nick Gordon from the temporarily inactive list. July 7, 2017 Chattanooga Lookouts placed SS Nick Gordon on the temporarily inactive list. April 6, 2017 SS Nick Gordon assigned to Chattanooga Lookouts from Fort Myers Miracle. January 6, 2017 Minnesota Twins invited non-roster SS Nick Gordon to spring training. May 11, 2016 Fort Myers Miracle activated SS Nick Gordon from the 7-day disabled list. May 4, 2016 Fort Myers Miracle placed SS Nick Gordon on the 7-day disabled list. April 4, 2016 SS Nick Gordon assigned to Fort Myers Miracle from Cedar Rapids Kernels. April 6, 2015 SS Nick Gordon assigned to Cedar Rapids Kernels from Elizabethton Twins. June 10, 2014 SS Nick Gordon assigned to Elizabethton Twins. June 9, 2014 Minnesota Twins signed SS Nick Gordon.